Victorian England. Zombies. With an intro like this I was immediately reminded of the dire Pride and Prejudice and Zombies, and more than a little apprehensive. Luckily, I was positively surprised by R.G. Bullet’s first YA book (or rather, “excerpt”) The Caldecott Chronicles. It’s a very short book, so this review will also be a compact one. The short book of 120 pages is written in the form of a diary, and it details the exploits of the 32nd Earl of Rothshire. In 1896 everyone – aristocrat and peasant alike – is inexplicably hungering for warm flesh, and the fine Earl must adjust with the aid of a young peasant girl and a fine Purdey shotgun. What follows is a lot of fun. What makes The Caldecott Chronicles so enjoyable? Since I can’t avoid comparisons with Pride and Prejudice and Zombies, here goes. TCC isn’t too over the top. You won’t find ninjas, katanas, Shaolin monks or any of that here. What you will find is bear traps, steam technology and a somewhat stiff upper lip. Bullet is also a pretty fluent writer, and the book is an easy read. While not quite reaching “hilarious”, the book did give me a fair few chuckles mostly relating to the polite and reserved mindset of the main protagonist. The book is fairly well grounded in the period, and there weren’t any glaring historical errors. All in all, TCC was what I had hoped PaPaZ to be. As mentioned, TCC is a quick read. I read it via Amazon’s Kindle cloud on my Android phone, and the book was nicely suited to that platform. The second book is available now, with more on the way soon. Overall verdict: The Caldecott Chronicles nicely combines the elegance of Victorian England with shambling undead. 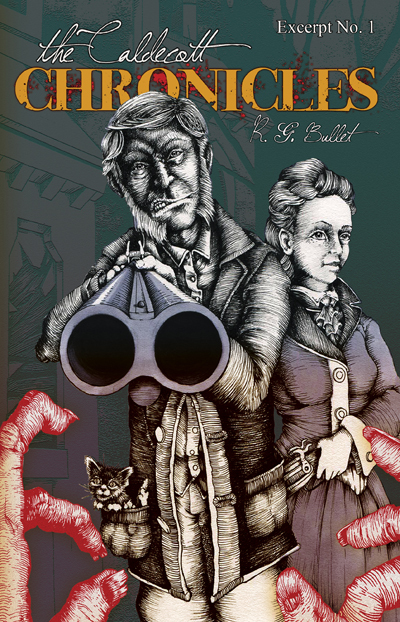 The result is a fun, humorous mix of period and zombie fiction, and yet another great YA book. Definitely worth getting, if you’re looking to grab a quick bite-sized read. At $3.44 from Amazon it’s a steal – and if that’s too high for you, you can get it for free for a limited time. You can read my interview with R.G. Bullet here!